Analog Lab 3 gives you instant access to over 6000 of the best designer sounds from the 21 authentic legendary keyboards in our critically acclaimed V Collection. Analog Lab is your all-in-one sound bank solution for every playing situation. When composing, Analog Lab gives you quick access to the inspirational mainstay instruments and tones that keep you in the creative flow. When recording, you’ll quickly find track-ready instruments that can be easily tweaked in Analog Lab or take you right into the full V Collection instruments you also own for total sound design. When gigging, you’ll step through all the decades of sounds you need right at the touch of a button or pedal. Save your back and your wallet. With Analog Lab, your laptop replaces stacks of keyboards and racks and gives you even more flexibility. Under the hood, Analog Lab has all the sound engines from our award-winning V Collection of modeled instruments that reproduce the actual characteristics of the original hardware. The organic warmth of analog and electro-acoustic sounds is extremely difficult to reproduce authentically with digital technology. Samples only capture snapshots, and no amount of snapshots can possibly convey all the nuances of playing the original instrument. 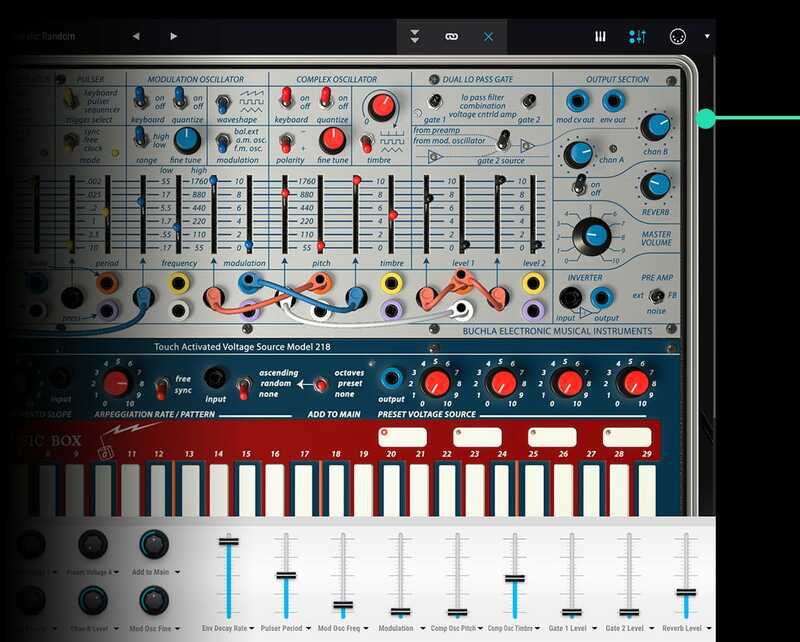 Arturia’s critically acclaimed TAE® technology and physical modelling technology faithfully emulate the actual physics and circuitry of vintage instruments—transistors, tubes, pickups, preamps, the works—to create software instruments that are virtually indistinguishable from the originals. Give your music the sonic richness and organic texture of analog—with all the convenience of digital. Want to play a funky bass with your left hand and a customized twirly Wurli with your right? How about bringing in a layer of strings in with your expression pedal while playing that piano ballad? Stack your favorite piano and strings? The Multi feature lets you simply drag and drop to combine any two of your favorite presets into splits and layers, complete with discrete options for key range, MIDI channels, transposition and response to common MIDI CC messages from controllers like touch, wheels and pedals. Then just save it as a preset for when you need it again. We’re talking full creative expression and control. Analog Lab gives you a complete array of 13 classic effects that take these already incredible sounds beyond the call of duty—everything from standards like chorus, delay, reverb and overdrive to exotics like bit crunching and vocal filters. You can even add different amounts of discrete effects to the two instruments in your Multi patches to add a whole new dimension to your sound. Of course, all your effects settings are saved right with your patches for instant recall. Analog Lab brings together everything you need to rock your performances—just add your favorite controller. We spent a lot of time redesigning the user interface in Analog Lab to make it easier and faster than ever to get to just the right sounds. Its streamlined UI lets you filter this vast library with combinations of tags for Types, Banks, Characteristics and Instruments. Looking for inspiration for a mellow synth melody? Just click tags like Soft, Lead and, optionally, instruments like Mini and ARP 2600, and you’ll instantly be auditioning just those candidates that match that combination. When you find sounds you like, mark them as a Favorite, and then access them quicker in the preset browser. When it’s gig time, simply put only the sounds you need into a Playlist and step through them with a switch or pedal. You’ll never get lost trying to find the right sound again—unless you want to. 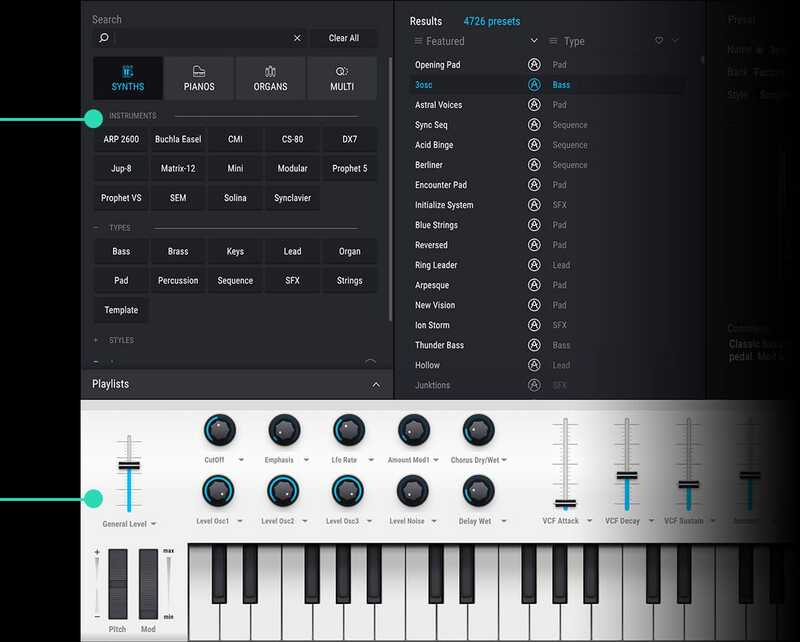 With each preset, Analog Lab surfaces the most common controls you might want to get your hands on to tweak your sound or control live—like the drawbars on a B-3 V or the filter controls of a Matrix-12 V. They’re even mapped automatically to the most logical controls on Arturia KeyLab and MiniLab keyboards, or NI controllers via NKS. With Multi patches, you even get macro control so that a single controller can affect parameters on two different patches at once. The MIDI Learn feature makes it as simple as click-and-touch to assign any hardware controller to any surfaced parameter in an Analog Lab patch for total expression. If you love getting your hands on all the controls, you probably already have one or more full instruments in the V series—and Analog Lab is also included in the complete V Collection bundle. Analog Lab makes the perfect command center for your V Collection. For starters, it helps you find sounds across your entire studio of vintage instruments. Then, if you want to make mods beyond the most common controls we’ve surfaced, with a click you can go directly into edit mode for the full V-series instrument if you own a license for it. No matter what kind of music you play, Analog Lab has you covered. 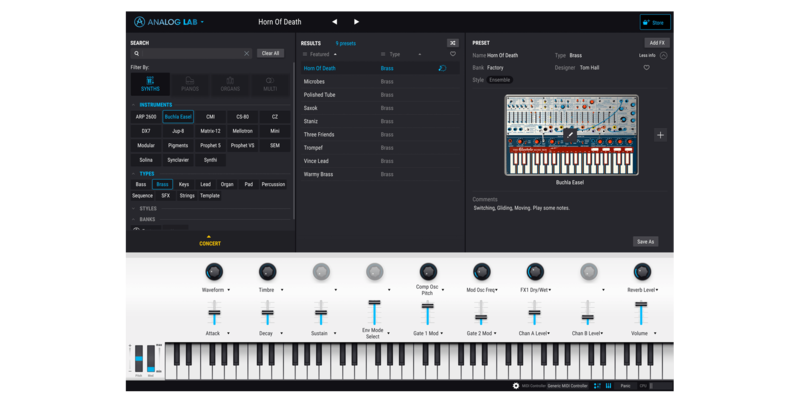 Think about the mainstay keyboard instruments in any genre of music that you write, play or produce—or ever want to—and you’ll find the best of those sounds in Analog Lab. Rock. Jazz. Gospel. Top 40. Country. Blues. 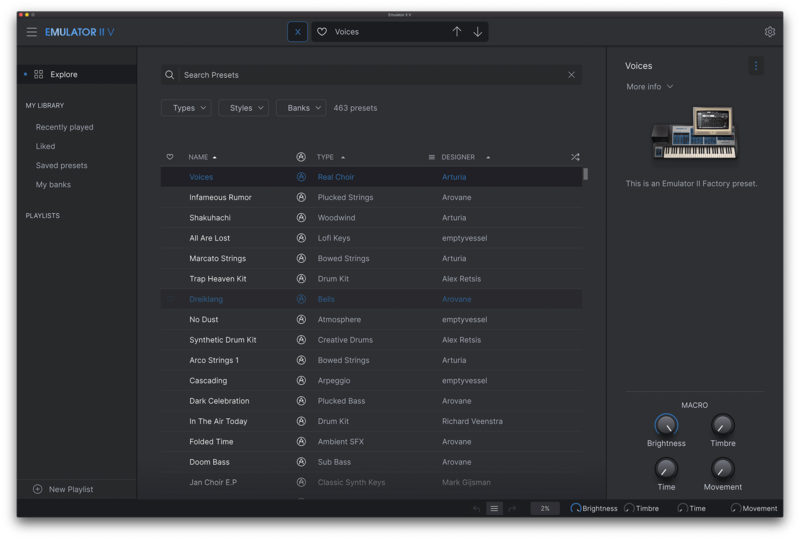 It’s all here, with total authenticity and easy access to tones created by some of the world’s top programmers and sound designers. 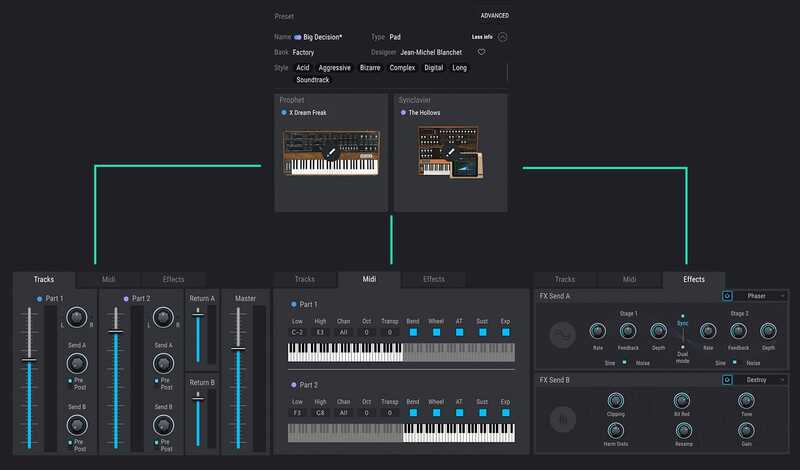 This demo was made exclusively with the Synclavier V.
Whether you’re playing hits from yesteryear or creating tomorrow’s music, Analog Lab brings you all the sounds you need in one elegant package.